TurnSeek a solution to your problem through our complaint center. Now get in touch with your home warranty company directly through our dashboard. The Complaint Resolution Program (CRP) helps you as a customer to get in touch directly with a representative from your home warranty company through our dashboard. A review submitted under the CRP is undertaken as a complaint and gives the home warranty company 30 days to resolve your complaint. 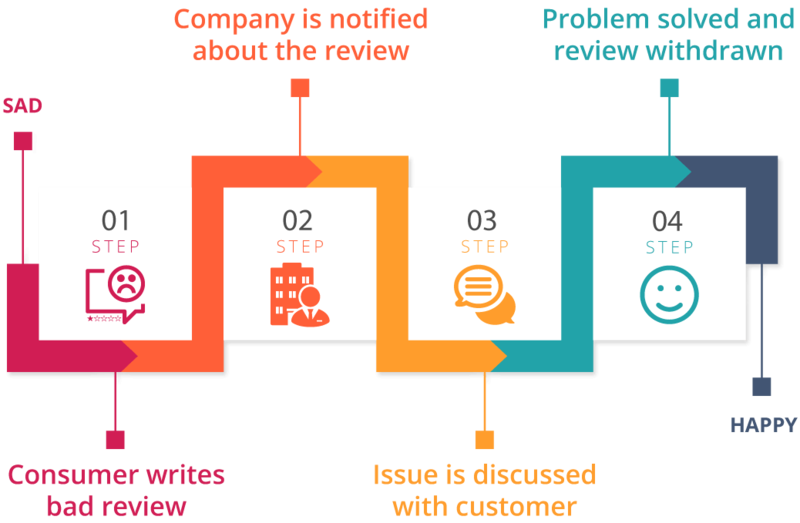 If you are not satisfied with the solution offered, the review will be published along with other reviews for the company on our website. Step 1.If you write a negative review with an overall rating of three stars or below about your home warranty company on our site, you are given the option to participate in the Complaint Resolution Program (CRP). Step 2.The home warranty company receives a notification about the negative review on the CRP dashboard. Step 3.You will be contacted by your home warranty company’s representative through the CRP dashboard. After that, you will receive an email informing you that the company has responded to your complaint. Please check your Inbox/ Spam/ Junk box for an email from us. You will also receive a notification on the CRP dashboard that a company representative has responded to your complaint. You can have a conversation and explain your issue to the representative. Step 4. If your problem has been resolved, you can close the complaint. If not, the review gets published after the 30 day period. You can directly communicate with a company representative of your home warranty service provider through our dashboard. Your negative review is brought to the attention of the company. The home warranty company’s representative gets in touch with you to resolve the complaint. You can close the complaint after the issue has been resolved. You even have the option to reopen a complaint later. Who Can Participate in the Complaint Resolution Program? Customers whose home warranty company has opted to participate in the program. You can visit your company’s profile on our website to find out whether it participates in the CRP. If it says ‘Yes’ for Complaint Resolution, you’re in luck and can go ahead and submit a complaint. Only existing customers can take part in the CRP. If you have canceled your policy, even a few days prior to submitting the complaint, we will not be able to help you. The review or complaint needs to be submitted in the name of the policyholder.